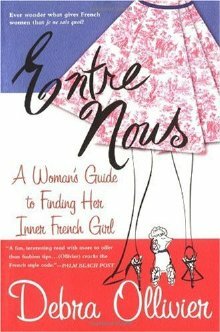 in honor of next year's paris + provence art + yoga retreat, coupled with my adoration of all things french, i have chosen entre nous: a woman's guide to finding her inner french girl as a light-hearted, fun, and flirty read after our past two heavier books. "Most American women would agree that those Frenchies have something going on. La Femme Nikita, Catherine Deneuve, even Audrey Tatou of Amélie fame-they all possess a certain je ne sais quoi. In this cutesy pick-me-up of a book, Ollivier-an American married to a Frenchman-insists that you, too, can be glamorous, mythic and mysterious; "a star in the pantheon of feminine beauty and strength." How can American gals tap into their inner Frenchness? Ollivier lays down the law, interspersing her must-dos with sidebars detailing, for example, legendary French ladies from Josephine Bonaparte to Coco Chanel. Among Ollivier's tips: for loungewear, think silk mou-mous or padded zebra-skin mules, not baggy sweat pants; toss the Equal and use regular sugar in your coffee; and go ahead and gossip, but be discreet. Stereotypical? Peut-être. But Ollivier's overall advice-seek beauty everywhere; accept character flaws; don't rush to define a romantic relationship-goes far beyond the realm of France and its women, and is evident in smart women the world over." the book will be placed in the lower right hand side of the blog may 1. in the interim, continue to savor the not so big life and get your hands on a copy of entre nous. you won't be disappointed! and, those of you joining me in france next year, will get a jump start on a recommended read. I love this book! I have it and I'm excited to read it again!! I have it too can't wait to dig in. Yes, I must find my inner French girl so I know what phrases like "Entre Nous" mean. I just bought the book and began reading it last night. I like it! This is either my second or my third reading of this book, and I enjoyed it. Her film and book suggestions are really the strength of this book for. While the bulk of this book is written in a third person reporting style (The French girl does this... The French girl does that...), it still includes some of the author's personal experiences of living in France. My personal preference is for more information regarding style, beauty, etc. The tour of the French girl's home was enjoyable, but the details of fetes, holidays, and weddings...Well, that wasn't of great interest to me -- even when I read it the first time. An enjoyable read, however, I prefer "All You Need to Be Impossibly French" by Helena Frith Powell. Frith Powell's book is largely first person accounts of the author's own evolution as a result of living in France. The writing is also a bit more witty and sharp. 5. p. 54 how to tie a scarf. -pg 7-"she practices discretion"-a good reminder! -pg 28-re: being comfortable in your own body and with nakedness! Something I know I have to work on! I am also reading another book on Paris that I would like to recommend called "Living the Sweet Life in Paris" by David Lebovitz. I'm finding this book a bit more grounded in reality and the writer is also super funny-amazing recipes are peppered throughout the book as well. This book is a wonderful read! I spent a few nights with a glass of wine reading and really taking in the author's words. Great book pick! I have to admit that I am in two minds about this book. I should point out that I am not American so this book is not aimed at me so that might be the problem. I will start with what I liked about the book. 1) The movie recommendations. My online DVD rental wishlist is now much longer than it was when I started this book! 2) The little hints and tips. I have tried to memorise the section on how to wear a scarf as I have never been able to make a scarf look chic. 3) I think it is a great book to read if you are stuck in a rut and just want to see that there are other ways to live your life. I found the sections on how make time for yourself and live an authentic life really inspirational. I am also going to work hard at choosing quality over quantity when planning my wardrobe. Okay, here are the things I didn't like about the book. 1) The author makes a lot of generalisations about what French women are like, but I have met lots of French women who are nothing like this. I have also met a lot of women from other countries who are. At times I felt that the author was such a Francophile that she was just attaching the label "French' to any trait or characteristic that she admired. 2) I passed the book on to my French friend Anne as I was interested to hear her opinion. She felt the book completely ignored the negative aspects of being a woman in French. She didn't like this, but she doesn't like the rose-tinted portrayal of French women generally. I can't imagine that anyone looking at the cover of this book would take it too seriously so I am not sure how big a problem that is. Last year I read a book called The Secret Life of France by Lucy Wadham, a Brit who has lived in France since the 1980s. In it she looks at both the good and bad points of France, Britain and the USA. I felt her book had more depth and more objectivity and I therefore learnt a lot more about France and French women. Although her portrayal of what it's like being a women in France is sometimes negative, I actually enjoyed it more than this book as it gave me a better picture of how French women actually live. all, thanks SO much for your feedback on the book. indeed, a bit fluffy but a nice light read to balance out our "deeper" books. thanks for playing along! in an effort to balance out this light read, i've been searching for a new-to-me book AND a book about living life differently with a focus on also making a difference. i've stumbled upon chris guillebau's book "the art of non-conformity" and would like to give it a go for june's read. i hope we are all compelled to set our own rules, live the life we want, and change the world! bisous. I was surprised to discover that the French girl is more down-to-earth and accessible than I presumed before reading this book. She values quality and she is practical without forgetting her flair for the frivolous. The sidebar on "The Perfect Black Dress" (pg 44) was particularly well written because it shows how the classic wardrobe staple reflects many dimensions of the French girl's style. Like earlier posters, I also loved the movie recommendations. A fun, quick read!